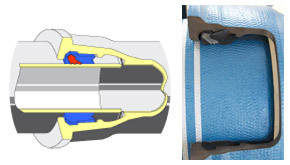 Standard self-anchoring joint for both potable water and sewer applications. Seal achieved by the compression of the gasket. The stainless steel teeth, embedded in the gasket, restrain the joint when under pressure. PAM’s anchoring solutions are designed according to two different levels of performance, plus a supplementary range to cater for some specific situations.